Shin Li Chang Co., Ltd., founded in 1987, is specialized in producing medium-sized anti-fur leather. The company covers an area of over 9,000 m2, building area of 4,000 square meters, and equipped to play soft machine, spraying machine, microdermabrasion machine, drum dyed, wrestling drum, embossing machine, superb handling equipment and perfect inspection test facilities. Fully equipped, unique technology, with first-class level of tanning technology and operating environment, existing technical staff of more than 50 people, with a strong technical team. The company is gradually perfected advanced enterprise management systems and incentives, and actively implement the ISO9001 quality management system, adhere to the "stable quality, good service" principle, strive for world brands, and continuously forge ahead, and establish a corporate creative spirit. The company mainly engaged in the general anti-fur, silk, super mercerized anti-fur, water repellent anti-fur, waterproof anti-fur plate anti-fur, a special anti-fur, foil the anti-fur, the flocking anti-fur, oil and wax anti-fur, printing anti-fur and a number of products, widely used in footwear, leather goods, purses. The products are actively sold in mainland China, Vietnam, Indonesia, Thailand, Southeast Asia, and other countries and regions, enjoy a good reputation in the industry. 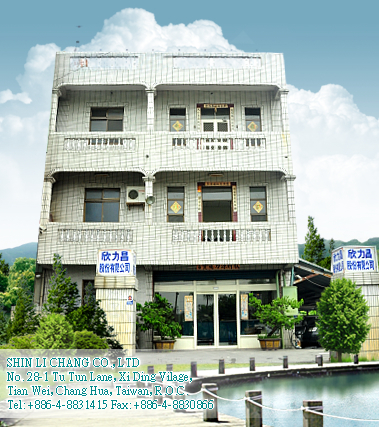 SHIN LI CHANG CO., LTD.
Tian Wei, Chang Hua, Taiwan, R.O.C.